A safe and simple action plan for autism parents. Each year, more than 50,000 U.S. families receive an autism diagnosis. On top of turmoil and worry, they share the same urgent question: What can we do to help our child? The answers parents find can be contradictory...even dangerous. The conventional approach (employed by too many pediatricians) is to medicate difficult behaviors into submission-suppressing symptoms while leaving underlying health challenges untouched. Surfing the Internet for alternatives just leads to confusion. Now, Dr. Janet Lintala, founder of the Autism Health center and an autism mom herself, shares the natural protocols used in her practice to dramatically improve the function and well-being of children on the spectrum. Drawing on the latest research developments, as well as personal and clinical experience, she targets the underlying issues (chronic inflammation, oxidative stress, gastrointestinal dysfunction, immune dysregulation) associated with the behavior, bowel, and sleep problems so common to autism. Correcting these overlooked conditions with digestive enzymes, probiotics, antifungals, and other nonpsychiatric treatments brings transformative results: less pain, less aggression, and a child who is more receptive to behavioral and educational interventions. While the medical profession is slow to change, autistic kids need help immediately. 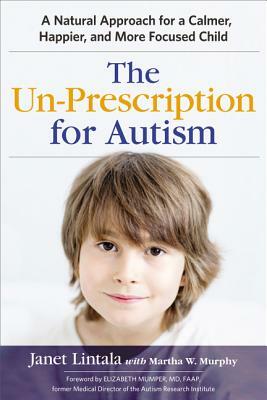 The Un-Prescription for Autism provides clear explanations, detailed protocols, and examples to help parents act quickly to restore their child's health, self-control, and language-paving the way for reaching their full potential. JANET LINTALA, DC founded and heads Autism Health!, serving children and adults in 12 states. Her advice integrates the clinical expertise of a nonprescription autism practice with the firsthand experience only an autism parent can deliver. MARTHA W. MURPHY is an award-winning health writer.